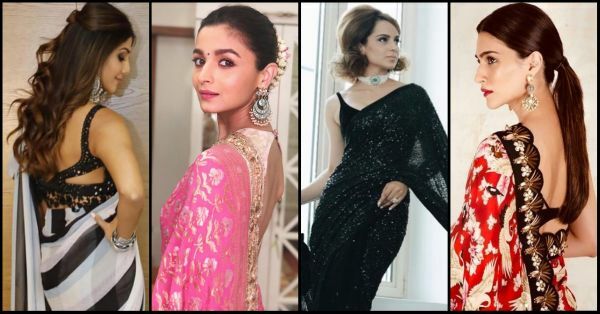 There is a reason why every woman, from our mother and grandmother to Bollywood divas like Madhuri Dixit and Deepika Padukone, is all about sarees. There is no piece of clothing more elegant and sophisticated than the nine yards of a saree. Banarasi silk or chiffon, Kanjeevaram or cotton, sarees come in all shapes and styles taking us from fabric to fab in minutes. But one of the most frequently asked questions about sarees among the millennial women and brides-to-be is not how to drape a saree. There are tonnes of easy YouTube tutorials and, of course, our moms to make us a pro at that. It is - what hairstyle to make that will go with the saree? Take Deepika Padukone for example. 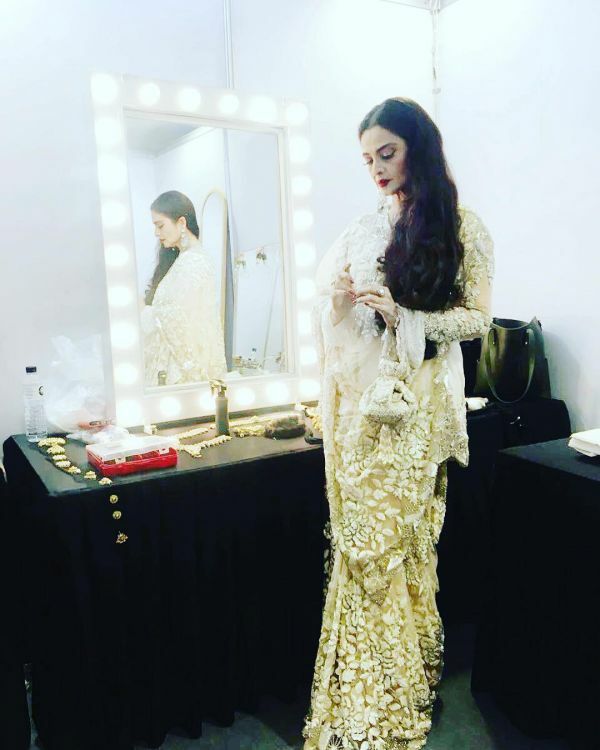 Deepika usually keeps her hairstyle clean and constant whenever she wears her floor-sweeping sarees drawing attention to her features and balancing out the overall look. With western clothing, however, the actress experiments with loose and ponytail hairstyles. So, clearly, hairstyle plays a very important part in your overall look. 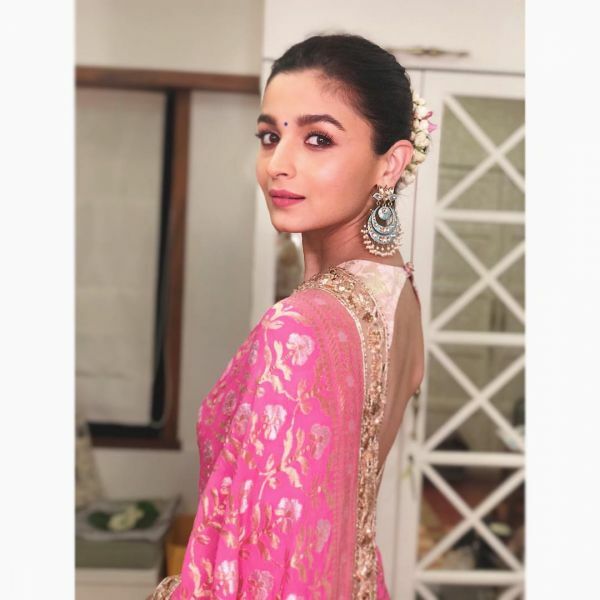 Here are different hairstyles of Deepika Padukone and other Bollywood celebrities that you can try this festive and wedding season or practice for your school or college farewell. There are different criteria to decide which hairstyle to pick. You can style your hair based on your hair length, your blouse design, your saree pallu drape or your face shape. 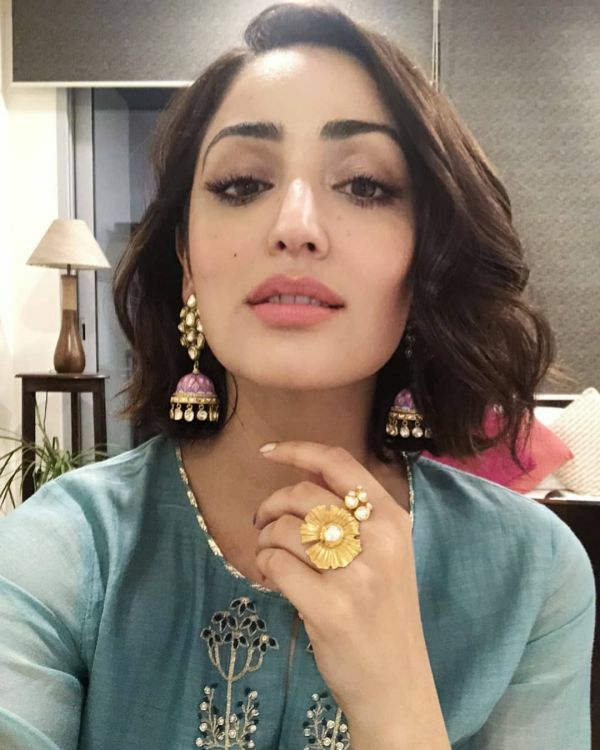 We are suggesting the most in-trend and easy hairstyles that will perfectly compliment your saree according to your hair length so you can pick a style without having to trim your hair short or using hair extensions. Take small sections of your hair and pin them using a hair clip. 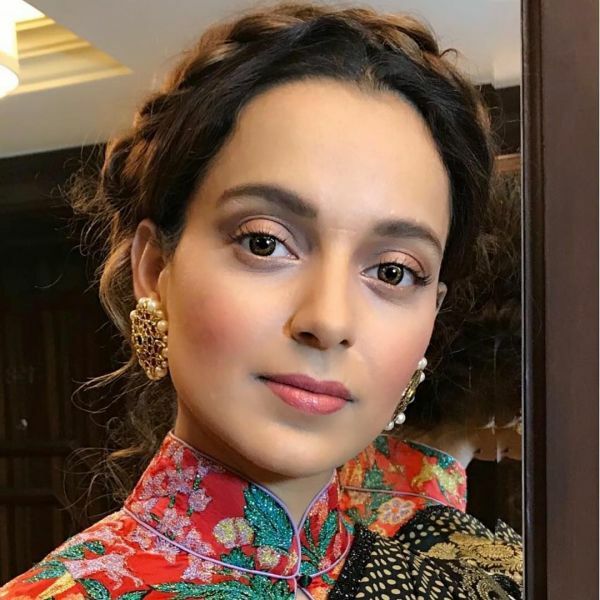 Take one section at a time and curl the bottom half of your hair using a curling iron (here are the best hair curlers in India). Make sure you don’t hold the iron for more than 6 seconds. Once all sections are curled, spritz some hairspray and roughy tousle your hair to get perfectly done soft curls. If you want more length in your hair, go for a straight hair look. Take small sections of your hair and use clips to pin them. Take one section at a time and run the straightener (here are the best straighteners in India) from the scalp to the tip in a slow downward motion. Repeat it until completely straight before moving on to the next section. Some hairspray or serum is all you need to add finishing touches to your locks. If you want to give your hair more dramatic and voluminous look, ditch the middle parting and side part your hair. Just a change in the parting can give your hair a makeover. This can also be done as an additional step after curling or straightening your hair. Remember Rachel’s iconic hairstyle when Ross kissed her for the first time? Yes, that is what we are going to do. Comb your hair and detangle them completely. Use a bun-stick to take your hair from one side of the head to the other side, twist them and secure with bobby pins. You can also use a designer clutcher to secure the French twist. 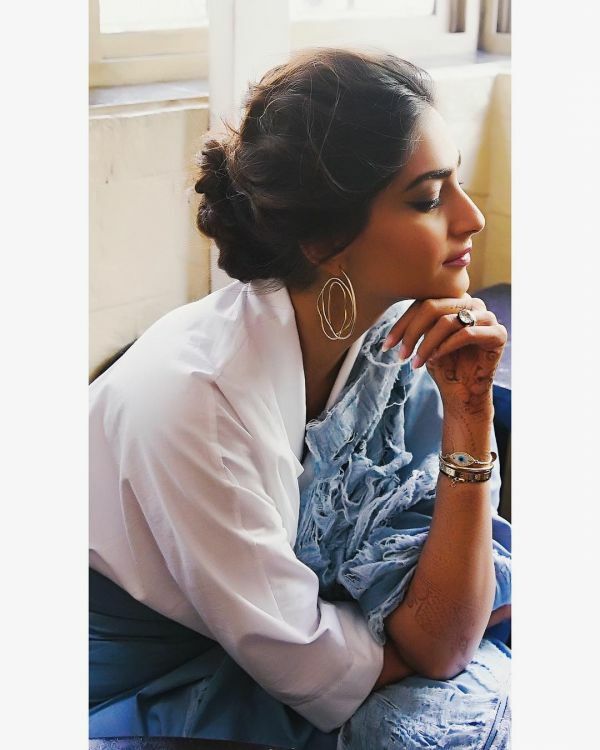 Also Read 10 Sneaky Tips For The First Time You Wear A Saree! This trendy hairstyle will work with any hair length even if you have a bob. Divide your hair into two sections - the top and the bottom. Make a french braid (here’s how to make a french braid) starting from the top section all the way down and secure it with a hair elastic. Now, from the bottom section, take a strand from the right side and wrap it around the hair elastic to hide it. Secure it with bobby pins. Repeat this on the left side and your hairstyle is ready. This one is super chic and a quick one. Create a middle parting. Take a small section of hair at the front of your face on your right side and start twisting it towards your ear. As you twist, take small strands of hair and add them to the original section. Once you reach the back, secure this loopy section with bobby pins. Repeat this on the left side and join the two sections together with bobby pins. You will have a crown-like half up do in no time. The easiest trick in the book to get beach waves is to spritz some sea salt spray (here are our top recommendations for salt sprays) in your hair. Sea salt is an excellent ingredient to add some texture and volume and get the natural beachy look effortlessly. You can also use a straightener or curler to get beach waves. Comb your hair and split them in a deep parting. Take a section of this hair and do a regular braid (here’s how to braid your hair) moving towards your ear. While you are at it, take small strands of hair and include them in your braid as if doing a french braid. When your braid reaches behind the ear, secure it with a bobby pin and you are done. Take a section of your hair at the crown leaving a few inches from the hairline, roll it and pin it with the help of clips. Part the few inches of hair in the front the way you naturally would and curl them inwards. Unclip the hair at the crown, backcomb them to create a voluminous bouffant. Comb the top part of the bouffant to smoothen out any flyaways. Gather some hair from both the sides and pin them at the back of your head in a half-tie style to finish off the look. Divide your hair into three sections making a low ponytail of each hanging at the nape of your neck. 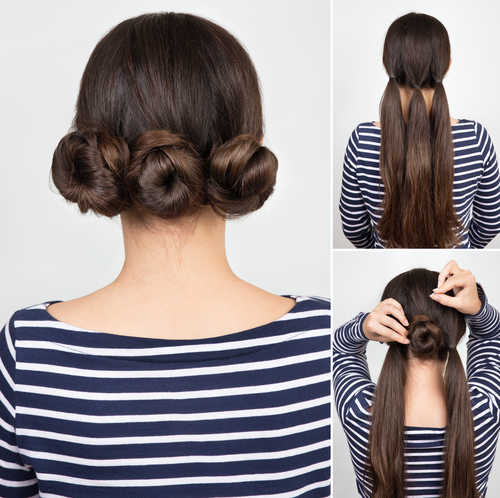 Take the first ponytail and twist it around itself to form a small bun and pin it in place. Do the same with the other two ponytails. Spritz some hairspray to set the do in place. Everybody loves a blow dry. It works with all outfits whether Indian or western is low maintenance and super easy-breezy to do. If you want not too straight, not too curly and celeb-like hair, here’s how you can blow dry your hair at home. Lately, salons have taken the blow dry game up a notch with the express blow dry technique. Book an appointment with your hairstylist a few hours before the function for a luxurious express blow dry. You can also try the new straightening brushes for a salon-like look. Seal your hair with a spray afterward. Add an ornate headdress or a statement maangtika to glam up the look. This hairstyle comes in handy when you have an impromptu party to attend or if you are running late for a function. All you have to do is take a section of hair from the top of your head based on how big you want your puff to be. Hold this hair up straight and start backcombing to create volume at the bottom. 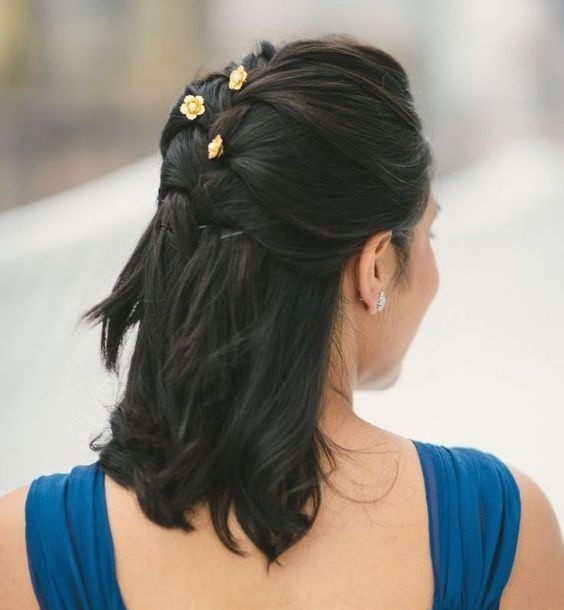 Pin this hair at the crown of your head making a dome-like structure and secure with bobby pins. Let your remaining hair loose and you are ready to roll. You can blow dry your open hair or straighten then to team this everyday hairstyle with a saree. The low twisted bun is the messy hair look that is the easiest of all buns to do since it doesn’t have to be precise and neat. After detangling your hair, generously spritz some texturising spray all over your hair. Gather them all into a low ponytail at the nape of your neck. Now, messily roll up this ponytail into a bun and secure it with bobby pins. If you have layers in your hair, this hairstyle is best suited for you. 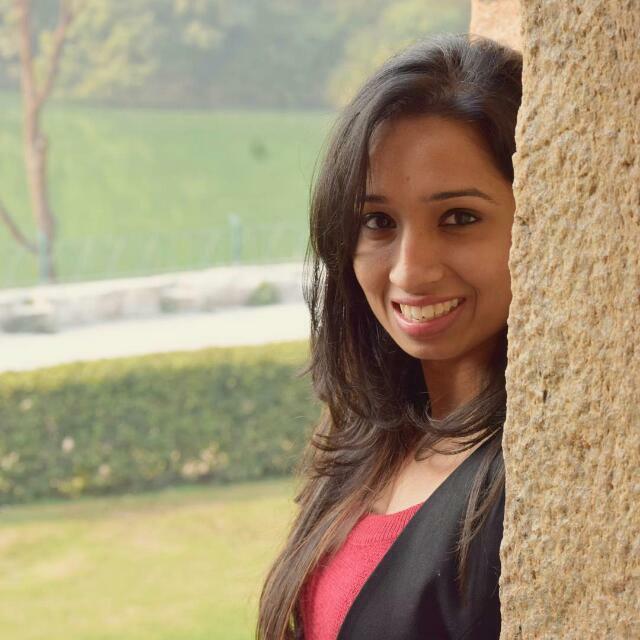 Got bangs but not sure how they will look with your saree? This hairstyle is how you hide them for good. Comb and set your bangs or flicks sideways, secure a dramatic puff with bobby pins on the crown of your head and form a simple but neat bun to hang at the nape of your neck. Ready for the Queen wave? Who says you can’t rock a ponytail with a saree? Perfect for the medium hair length, straighten your hair and tie them in a low ponytail at the nape of your neck. If you have 5 more minutes, leave two small strands of your hair on both the sides before tying the ponytail. After securing it with a hair elastic, wrap the two strands around it covering it completely. What a sophisticated do! Make a high or medium ponytail. Now, if you have bangs or flicks, you can use them to make a puff of your hair. Or you can make a puff at the crown of your head and let your flicks loose on the side. Your puffy ponytail is ready. The half tie is every mom’s go-to hairstyle because it is so easy to do and effortless. Take a section of your hair from the right side on the front near your ear and another from the left side. Join them together at the back with bobby pins or a clutcher. You can fancy this updo with braids as well. Simple and chic. Remember Elsa from Frozen? You see where we are going with this? Add a touch of magic to your look with an Elsa braid. 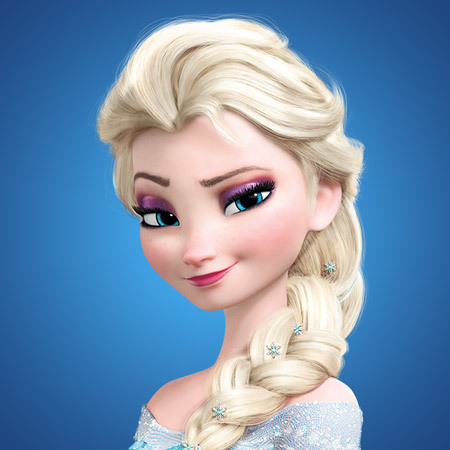 All you have to do is make a side braid, pull out the sections from the braid giving it magnitude and “Let it go”. How about an 80’s inspired big hair look this wedding season? Add a lot of volume to your hair by backcombing and teasing them. Set it with a texturising pr volumizing spray for a very retro look. Big, bouncing barrel curls don't require much sacrifice to set. Barrel curls, named for their cylindrical shapes, come in a few variations - the upright-standing barrel curl that tumbles down into loose, springy coils, and the flat-barrel curl that sits close to the head until set free into wide, cascading waves. You can achieve your choice of barrels with a curling iron or even with the classic hair rollers. Ah, the easiest hairstyle for women with long hair. Just sweep all of your hair on one side leaving the other shoulder completely bare. That’s it! Use a leave-in conditioner or serum to mute frizz and flyaways. You will never be late for another function ever. 2018 has been all about a sleek and clean look with middle-parted hair whether in a bun, a ponytail or simple open hair. Straighten your hair, and we mean poker straight. Gather them into a high ponytail and voila! If you have flicks, just make sure not to straighten them too much. Natural bouncy straight flicks would do wonders to your ponytail. If you want a pronounced look, replace your straightener with a curler and curl the lengths of your hair. Now gather them into a ponytail somewhere in the middle - not too high, not too low. Roll out some flicks from the front for a messy look. Make a full bun and be as precise as possible. You can also use a bun net for a clean look. The neater the bun, the better. Wrap it up in bright flowers or gajra and let the sweet fragrance of real flower give you more power. Keeping in tune with the trends of 2018, how about a tight and tidy look this party season? All you have to do is straighten your hair, part them down from the middle and secure them into a bun at the back. Make sure your bun is really low and clean. You can use a bun net for a perfectly formed look. Apply a hair gel or strong hold hairspray for a truly sleek and shiny look. Start by straightening your hair from root to tip. Using a fine-toothed comb, pull back all your hair and tie them into a super high ponytail right at the crown of your head. Roll this ponytail into a bun and secure it with some bobby pins. Pull out a few strands of hair from near your ears to frame your face and finish off the look. You can also skip out on straightening in the beginning if you want a messier top knot. It may look complicated but it is one of easiest buns to make. Pull your hair up in a high ponytail. Then braid it in a regular or any other style of your choice. Roll your braided high pony in a bun and secure with bobby pins. You can even try a side braided bun for an edgy look. Just make your ponytail slightly on the side. A milkmaid braid may sound laymen but it is anything but basic. It is the braid style where you wear your braid like a crown. Whether you want to let your hair open or tie them into a messy bun, that is your choice. 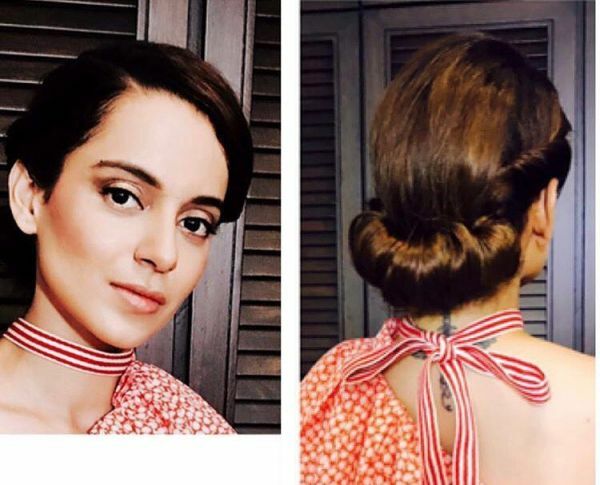 Here’s how to make an elegant milkmaid braid at home in just 5 minutes. Your Greek Goddess updo is ready. French braid is one the fanciest braiding styles that work well with western wear as well as Indian. If you don’t know how to make a French braid, here’s how you can do it yourself. Take your braiding game to the next level with a fishtail braid. All you have to do is watch the video and follow the steps for a perfect festive look. 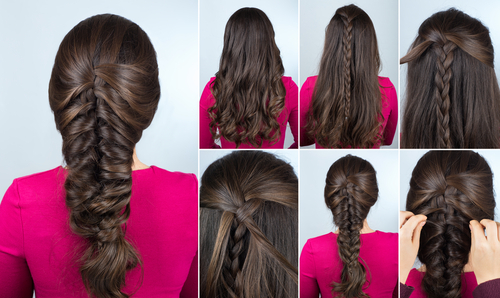 Here’s another braid style that can help you stand out in the crowd. Sit back, relax and watch the video on how to make a mermaid braid using the reverse braid technique so you can do it all by yourself. If you are all about simplicity but don’t mind a little fancying up here and there, then go for a regular long braid look. Glam it up with hair accessories like statement bobby pins in between the braids or small flowers like mogra and jasmine to pretty up the hair. The compliments won’t stop coming. The side braid and bun combo have never gone wrong on any ethnic wear till date. This trendy and upstage hairdo gives women a different look to their face, especially when you have thick long hair. Make a side braid as mentioned in point 8, and gather the rest of your hair into a low bun. Oh, so pretty! 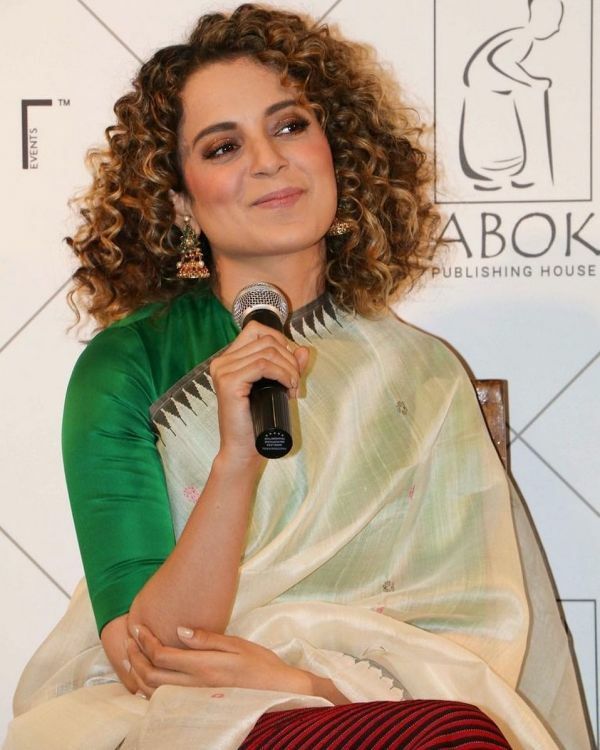 Ringlet curls like Kangana Ranaut can come in handy if you are a strict ‘no-heat hairstyle’ person. Imagine how much more wonderful they will look on long hair like yours. You can use hair rollers or even a pencil to get tight curls. Although it is a bit time consuming, the ringlet curl on long hair is worth the wait. To get fairytale curls, all you need is a curling iron. Curl smaller sections of hair for 10 seconds to form tight curls and smoothly roll them out of the curling wand. Leave them open or style them with bobby pins in your favourite way of hair partition. You can also add a jeweled clip or a stem-cut rose to make your fairytale curls truly royal. 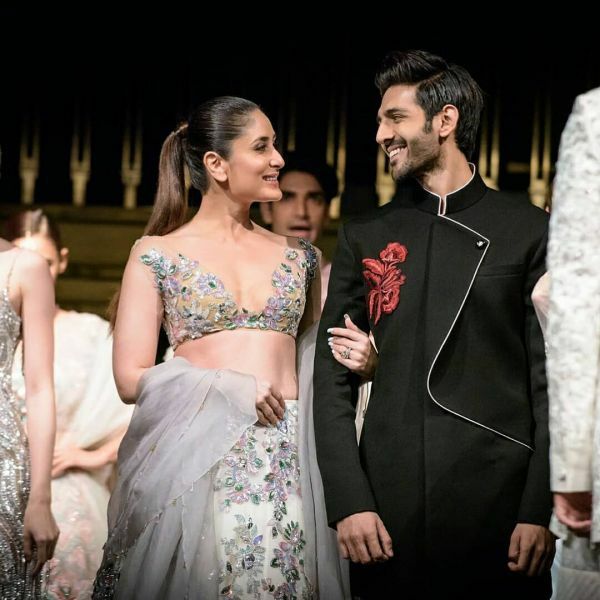 Also Read 10 *Different* Ways To Style Your Indian Wear This Winter! Heat-protectant: NEVER use a straightener, a blow dryer or a curler without applying a hair product. Whether it’s in the form of a spray, serum or mist, you must apply it to your precious locks to protect them from getting damaged. Here are our 15 favourite heat-protectants for you.